Mr Papafakis: Prime Beef in the 41st Millenium. 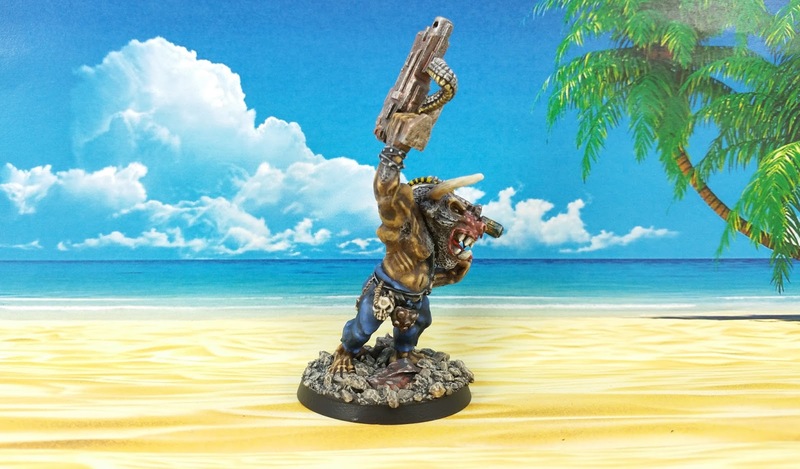 When I first came across the Rogue Trader Minotaur as a teen I was less than impressed. The idea of having a cannon on your head, to my mind was stupid, pointless and would yield zero benefit on the pretend battlefield. 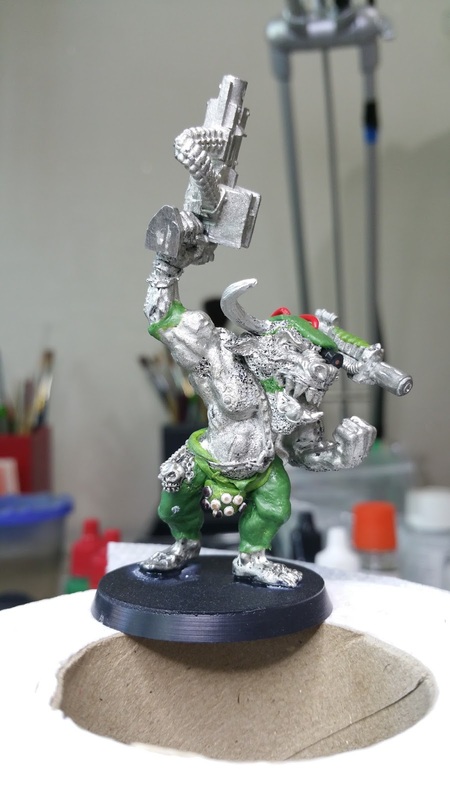 So my mates and I quickly decided that it was a crap mini and dumb idea, hoping to Christ that it wasn't a sign of things to come from Citadel. Fast forward 25 years and my taste in miniatures has gotten worse matured somewhat. To the point that a little while ago I got the urge to own one of my own. A quick perusal of Ebay put paid to that idea though, as the asking price was way out of my price range. Another good reason not to buy one of the originals is that they aren't the best sculpts in the world either. Painted up versions on SOL. Even with my rose tinted glasses on it's pretty hard to get excited about them. 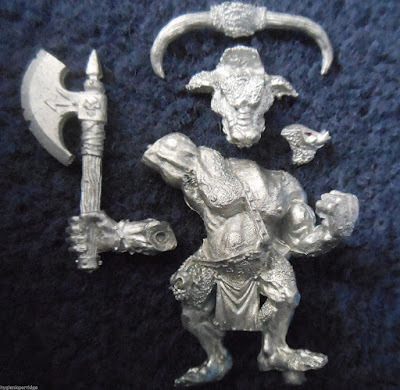 The one on the left is obviously a modification of the WFB, axe wielding Minotaur. Which is a pretty cool mini to start from, but then they faffed it by giving him a titchy little boltgun. If you look at the size of his hand compared to the size of the gun it just looks silly. Then there's the cow on the right which is, I dunno, a bit weird. The upright stance is ok, but his right arm is retarded. 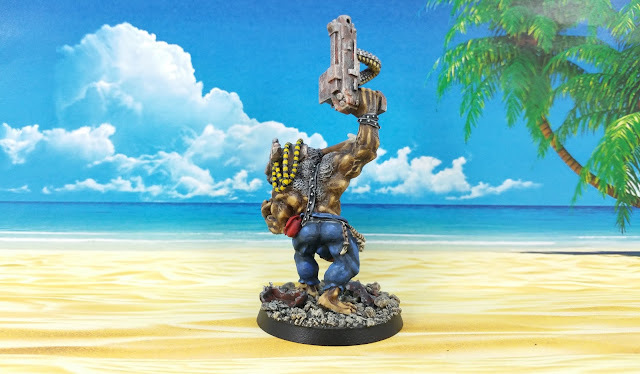 It's supposed to look like he's supporting the heavy bolter, but it mostly looks like he's punching it......fail. So I just decided to make my own instead. Added an armoured codpiece and pants and gave him a Heavy bolter. Meltagun for his head cannon and ran a few cables into his head. So, I now have an RT Minotaur. I'm pretty happy with how he turned and I'm looking forward to seeing what sort of trouble he can cause on the make believe battlefield. Wow! Good call Ranalcus. That's a very cool comparison. Even though I played Doom when I was teenager I had completely forgotten about that character. Doom 2 is still popular and gets lots of mods/maps etc. Glad you like him Grover, I'm chuffed with him as well. Hopefully we'll get to use him in a game togethe one day. Oh, and you can never go wrong with blue pants IMHO, for the discerning low life, denim is king. 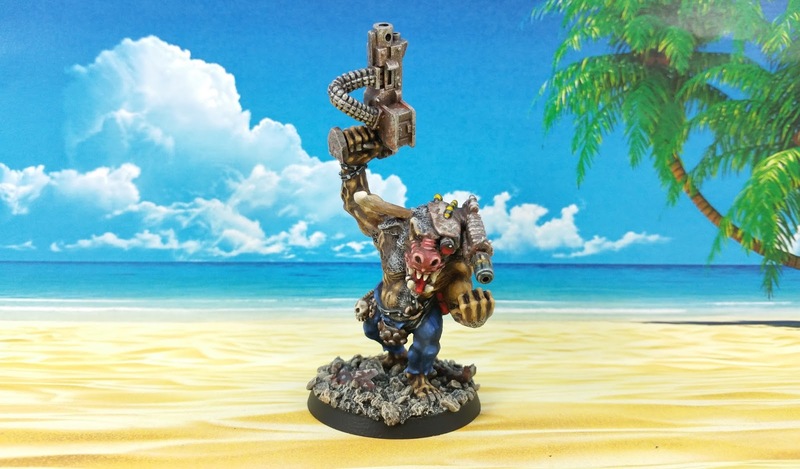 Fantastic conversion and paint job. I also want to see what kind of mischief he can get up to. Yeah, I can imagine he'll go in all gung-ho but then get distracted by a fertile patch of grass at the critical moment. Still, when he gets it together it'll be hilarious. Glorious! Have to agree with you on the tininess of the bolter. I remember being really disappointed with some of the Rogue Trader robots for exactly the same reason. What's the point of all those wires and servos and being twenty feet tall if you're still only holding the same weapons as a man can? Lovely job on this mino. You've nailed what made the originals "iconic" with the headgun. It's strange isn't it, I'm not sure why they chose such a small weapon for him. Maybe they had a concern with the shape of the mold? Dunno, either way it looks pants. Wow that has got me really smiling! Huge improvement over the original. I really like the cables coming from his head and the shooting in the air pose. I spent a bit of time looking at all the Minotaurs that GW have released over the years. There's fasands of'em! So I was kinda spoiled for choice. The one that I ended up settling on was released with a range of maybe 10 in total? And luckily for me they're pretty ugly, and therefore not sought after so much. I just picked the one that looked like it'd be the easiest to convert for RT. Haha, that's a tribute! I find it amazing to see how you turned the original into this whole new concept. So cool! It was begging to be done again. The originals were a bit of a travesty. That's a really nice conversion and a good paint job too! Interesting how some older-but-not-really-ancient models can be the basis for interesting conversion work. Great stuff. It is isn't it! Some of the artwork/descriptions/miniatures from the RT days left open quite a few possibilities for improvement/conversions. They really dropped the ball on those originals. Maybe it was the work experience kids turn at sculpting that day? All minotaurs now need armored cod pieces! He looks great, but how can he be so angry at sick a lovely Beach? Maybe he ran out of beer? A bulls aggots make an enticing target on the toy battlefield, best protect them with whatever you can find. I don't think he's angry, it's just the way he smiles. Just happens to look exactly the same as when he's pissed off is all. Great conversion like the head cannon although I actually like the original except for the pitiful gun. Perhaps the beach owes more to the Norse Valhalla myth where they all fight but rise again in time for beer? Why is he not punching the side of his gun? THe gun should also be very tiny! YOUVE DONE IT ALL WRONG! I is not wrong, YOU ARE WRONG!!!!! My creation is much more betterer than Gdubs one!!!!! It's SO true it hurts in my tum tum. I honestly think the initial idea for them was a bit weird, but if that wasn't enough, they botched the execution of it too. That'll learn them. I love this modernising (if you can call a retro conversion on a middle-aged figure modernising!). 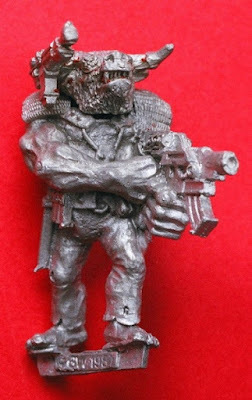 The conversion is really nicely executed - the trousers look great and I do love his cranial meltagun. 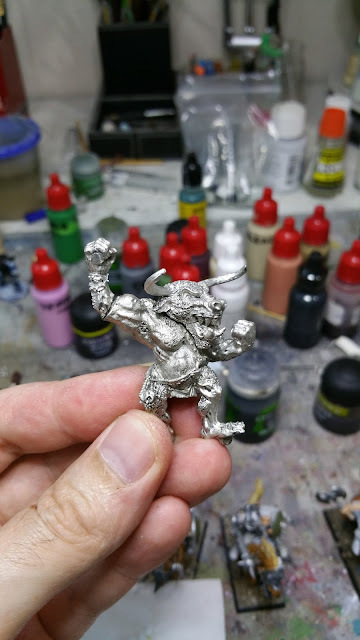 The only downside is that you've pointed out lots of flaws in the original cyber minotaur - a figure I have sitting waiting for paint, and that I actually really like. 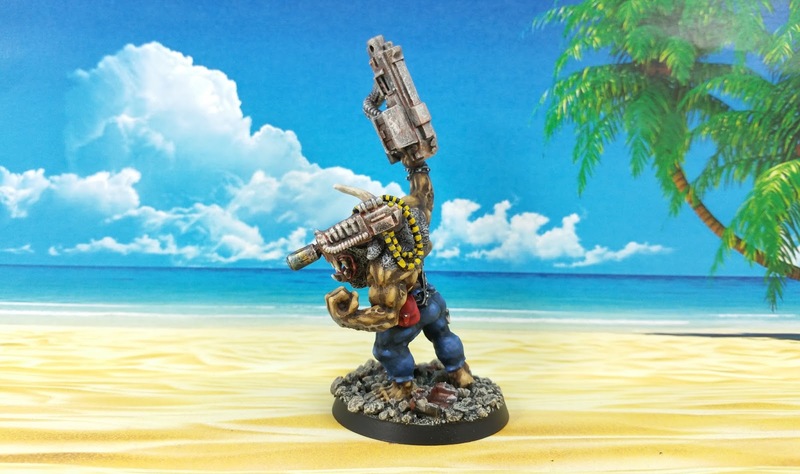 I'm not going to be able to look at his titchy boltgun in the same way ever again!! The bolter is a fine piece of hardware on any human sized mini, but on anything bigger it just looks silly. Have a look at the size of the fist of the Minotaur that's holding it. He wouldn't be able to hold the thing properly, let along fit one of his sausage sized fingers through the trigger guard to be able to use it. 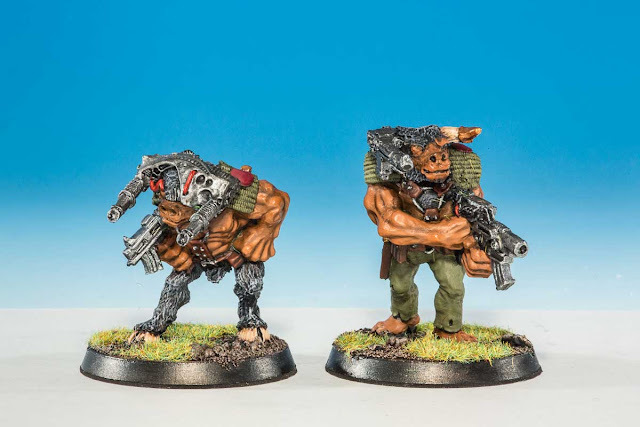 Don't get me wrong, they're both salvageable miniatures, but IMHO I think they'd need some thoughtful modifications made to them before they'd look like great. Anyway, waffling over. Thanks for the praise of my conversion Axiom. I'm happy with the results. Hopefully, one day, in the not too distant future, we can pit our Madcows against each other on the pretend battlefield. Indeed, for us mere mortals that would be true. But the big bad cow would probably view severe 3rd degree burns to the side of his face as a badge of honour. That is some top drawer conversion work, Mr. P. and beats the hell out of the originals. 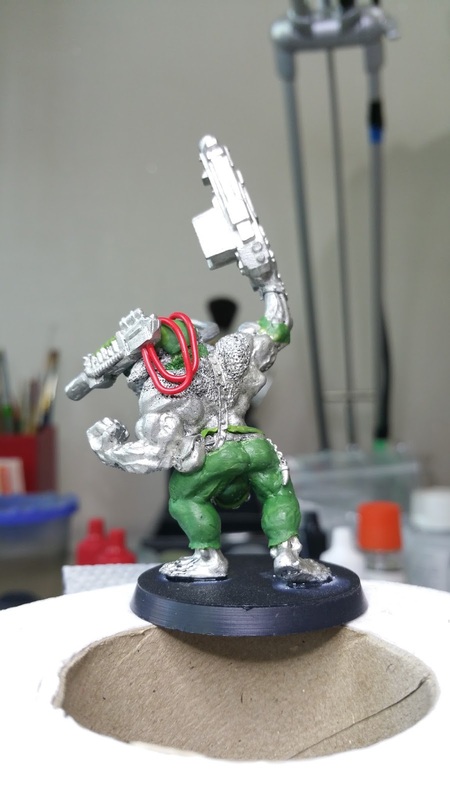 I hope this post leads to a lot more minotaurs on the 40K table. I always loved the idea of beastmen and Ogryns being allies of the Imperial Army... it's a lovely reversal of expectations. Yeah, I'll definitively be plonking him down on the table whenever the next chance presents itself. I totally agree re, the the beastmen and Ogryns. 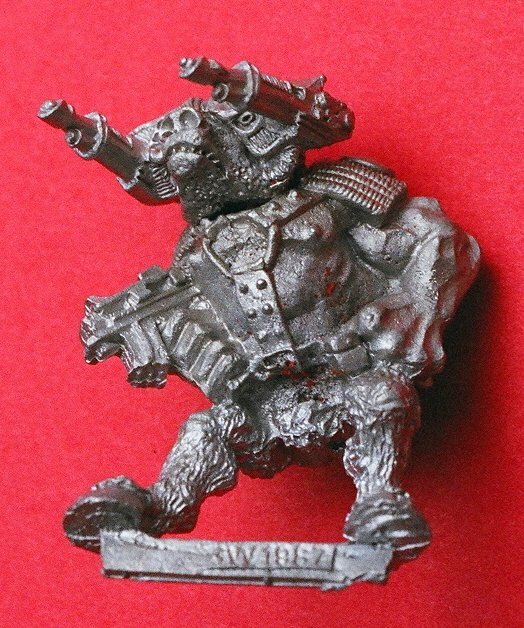 It was a real shame that they didn't release more than one beastmen mini that was kitted out for war in the 41st millennium. A missed opportunity. The Ogryn minis are ace though, so we did get those. That's the best Brahma Badass I've seen in a good while. Bar Nun. Which . . . gives me an idea. Cheers Composer :) I look forward to seeing what your idea is going to be.